Doxycycline 200 in 1 ml contains as active substance 200 mg doxycycline hyclate and adjuvants: 1-methyl-2-pyrrolidone – 150 mg, propylene glycol – 0.65 ml. 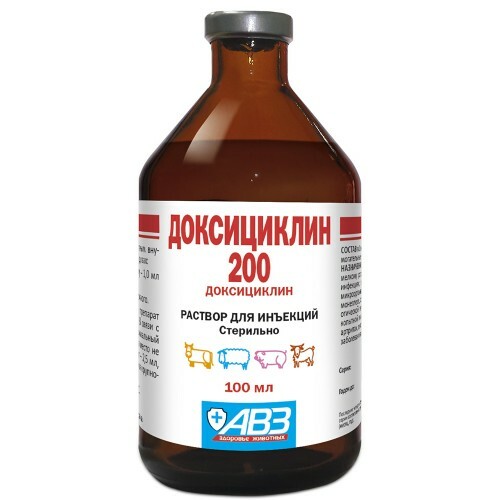 Doxicillin 200 is indicated for porcine, bovine, goat and sheep curative purposes for infections caused by doxicillin-sensitive microorganisms, including colibacteriosis, salmonellosis, staphylococcus, pneumonia, haemophilosis, porcine enzootic pneumonia, rubella, pasteurellosis, necrobacteriosis, keratoconjunctivitis, infected, arthritis, sepsis, abscesses, chlamidosis and other bacterial or mycoplasmatic diseases. – pigs – 0.5 ml / 10 kg body weight (10 mg doxycycline / 1 kg body weight). If necessary, the preparation is repeatedly administered over 48 hours. In relation to the apparent injection pain, the maximum inoculated volume in one place should not exceed 2.5 ml for adult pigs, sheep and goats, 5 ml for bovine animals, 10 ml for pigs and lambs. Contraindications for the administration of Doxicillin 200 may provide increased individual sensitivity to the components of the preparation, including anamnesis. The use of pregnant and lactating animals with renal and hepatic impairment is prohibited. The slaughter of animals for human consumption is allowed not earlier than 21 days after the last administration of Doxicillin 200. Carcases obtained before the deadline can be used in animal feed. Doxycycline 200 is packed with 50 and 100 ml each in dark glass vials of appropriate volume. Individual bottles are packaged in cardboard boxes with instructions as well.